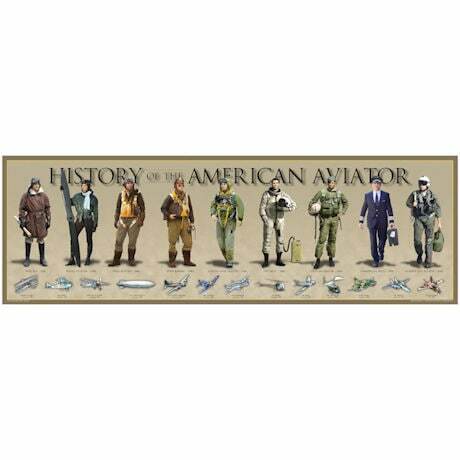 Big, colorful print celebrates flyers through history and their flying machines, from WWI pilots to modern-day fighters, from the Wright Brothers' plane to the Spirit of St. Louis and today's fast and fierce military jets. Fade-resistant ink on 80-lb. acid-free paper with a matte finish. Available unframed (XB5742), 36" x 12" or double matted in a brown frame under glass (XB5052 - sold separately), 44" x 19".